Arachne Press presents a writing workshop on the theme of Festival. 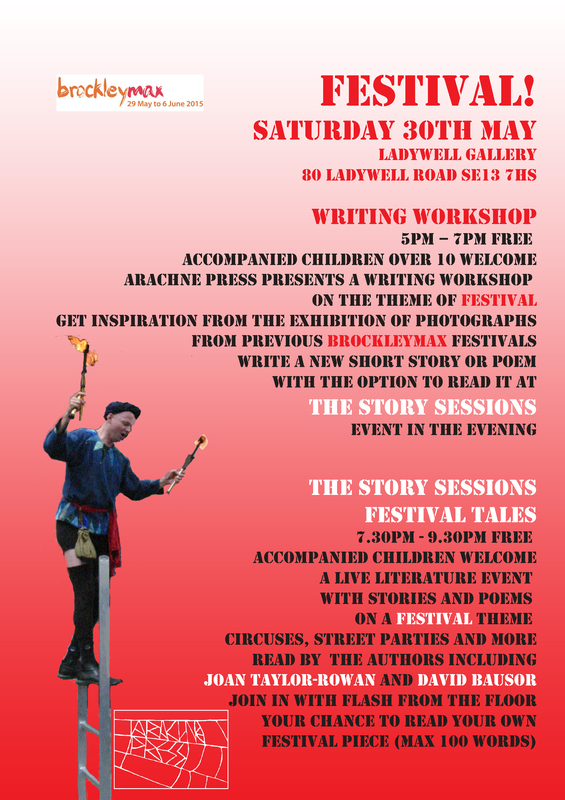 Get inspiration from the exhibition of photographs from previous BrockleyMAX festivals and write a new short story or poem, with the option to read it at The Story Sessions event in the evening. A live literature event with stories from Joan Taylor-Rowan and David Bausor, poems from Elinor Brooks (read by actor Miriam Lee) and Jennifer A McGowan on a festival theme. Circuses, Street parties and more. Join in with Flash from the Floor – your chance to read your own festival piece (max 100 words). 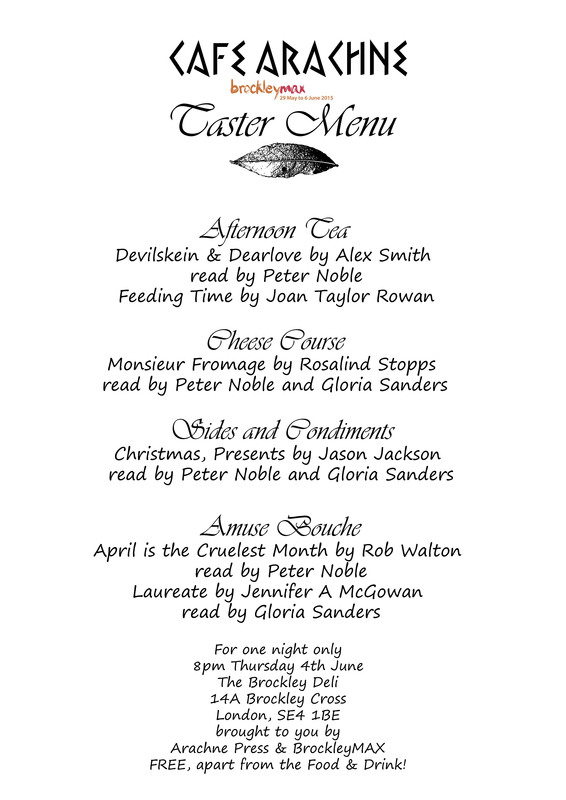 A free live literature event all about food Stories from Rosalind Stopps, Joan Taylor-Rowan and Jason Jackson, Poems from Jennifer A McGowan and Rob Walton, plus an extract from Devilskein & Dearlove,our Carnegie Nominated young adult novel by Alex Smith – mostly read by our actor friends Peter Noble & Gloria Sanders. Join us for a story set in a cheese shop, Cranberry Sauce as an excuse for an illicit meeting, trying to win friends with cookies and taking tea with a demon, plus poems about oranges and bay leaves! Order appropriate food to ‘taste-along’. This entry was posted in Events, Festival, join in, live literature, poetry, readings, short stories, Story Sessions, workshop, writing, Young Adult and tagged Alex Smith, Brockley, Brockley Deli, Brockley Max, David Bausor, Devilskein & Dearlove, Elinor Brooks, Gloria Sanders, Jason Jackson, Jennifer A. McGowan, Joan Taylor-Rowan, Ladywell Gallery, London, Peter Noble, Rob Walton, Rosalind Stopps, The Story Sessions by Cherry Potts. Bookmark the permalink.